AquaSept™ is the only fully autoclavable sterile delivery system on the market. AquaSept™ seamlessly integrates on most dental units, providing superior patient care. The AquaSept™ system is a valuable addition to any dental office, decreasing procedure time while increasing patient volume. The size of an AquaSept™ dental unit shown below. 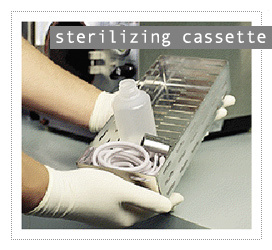 The entire unit fits into a sterilizable cassette. Autoclave the AquaSept™ system after each patient. A quick disconnect allows for fast, easy breakdown and transitioning between patients. Entirely autoclavable, AquaSept™ provides a truly sterile dental unit. 0 CFU/mL, every patient, every time. No chemical shocking, no tablets, no worries. I've been using the AquaSept System for about 20 years. I am thankful to have had the peace of mind and confidence that this system provides, as no other system does."